Hammond Vintage Rt-3 & Tone Cabinet & Leslie Sold! 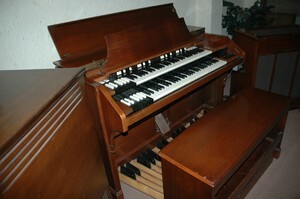 Hammond Rt-3 Vinatge organ, also known as a Concert B3/C3 organ. In Mint Condition with Hammond Tone Cabinet, Leslie speaker, new reverb and full dealer warranty. A quote from VINCE SENERI: "This classic organ plays & sounds AWESOME". Call for information 973-377-2251 Financing available.